Like a blinding flash of the obvious, the single most viable solution to all of these issues is an aggressive move in the direction of consuming much more whole, plant-based foods—not necessarily becoming vegetarian or vegan. This book clearly explains how and why we began eating the wrong food for our species and provides helpful guidelines for getting us back on the road to vibrant health and effortless weight-loss. Fortunately, despite the incredible complexity of our current dilemma, the solution is refreshingly simple. It simply requires educating yourself, making better choices in what you eat, and then share all that you have learned with everyone you care about. There has never been anything more important in the history of the world. 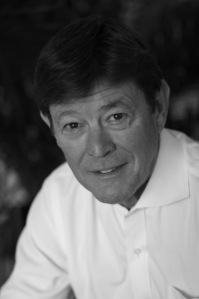 A former senior corporate executive with Ralph Lauren in New York, J. Morris Hicks has always focused on the “big picture” when analyzing any issue. In 2002, after becoming curious about our “optimal diet,” he began an intensive study of what we eat from a global perspective—discovering many startling issues and opportunities along the way. Leveraging his expertise in making complex things simple, he is now delivering his powerful message in his book, on his daily blog, and in public speaking engagements—embarking on his new career as a writer, speaker, blogger, and consultant—promoting health, hope, and harmony on planet Earth. J. Morris Hicks has done us all a tremendous service. He has put together a simple, clear, and profoundly helpful guide to the extraordinarily powerful benefits of plant-strong nutrition. 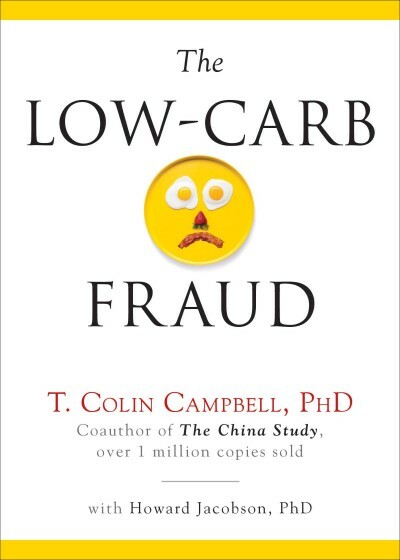 If you want to be healthy, read this amazing book. In a world hungry for hope, this book arrives at precisely the right time. Healthy Eating, Healthy World is more than an eye-opening, fact-filled book about the causes of poor health. It is a map leading directly to the cure. In the process, it points the way toward solving the seemingly unrelated problems of environmental destruction and world hunger. It is sensible, direct, and right. 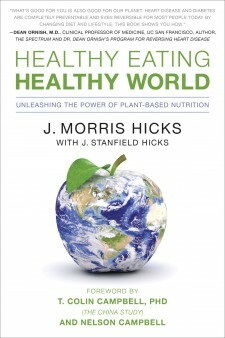 Healthy Eating, Healthy World is by far one of my favorite books. 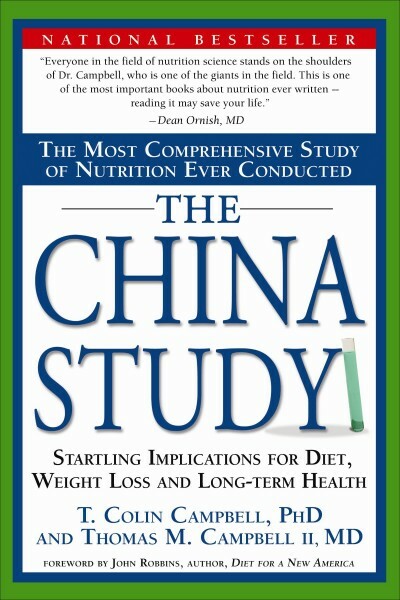 It is incredibly informative, well researched, and a must read for anyone who eats! It takes you on a journey towards adopting a plant-based diet in a way that isn’t overwhelming and provides much needed tips about eating this way for good. Poor nutrition is our leading cause of disease. Yet the biggest impediment to improving our health is that most people mistakenly believe they are eating a good diet. With the costs of disease out of control and threatening the economic health of our country, Healthy Eating, Healthy World is a timely contribution, explaining in clear, easy-to-read language why our standard diet is making us sick, and how you can make simple choices that will improve your health, longevity and quality of life. This is a must-read book. Highly recommended! The same standard diet-style, rich in processed foods and animal products, and low in produce, that places people at high risk of heart attacks and cancers, is also rapidly destroying our environment. Healthy Eating, Healthy World reports on critical information you must learn to help ourselves and our planet. 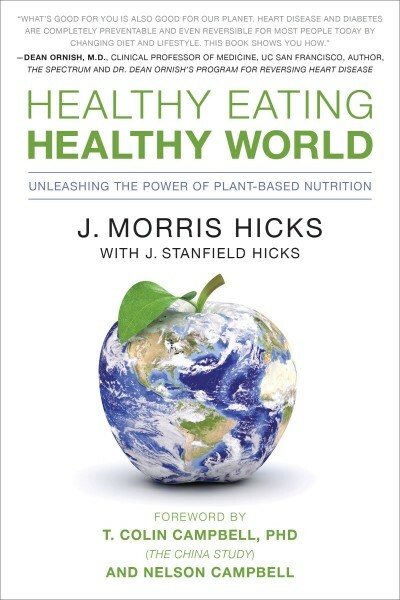 J. Morris Hicks's world-changing book, Healthy Eating, Healthy World, is compelling in transforming our health -- promoting dietary choices to be over 80% from whole plant foods. Not only will we restore our own fitness, vigor and happiness as we become healthier; we will be celebrating a world-wide paradigm shift by living in harmony with nature on our precious planet. Reading and implementing Healthy Eating, Healthy World is the best prescription you will ever fill. In Healthy Eating, Healthy World, the title tells it all, as author Jim Hicks masterfully resolves global challenges in a sensible, well-written, highly referenced must-read. 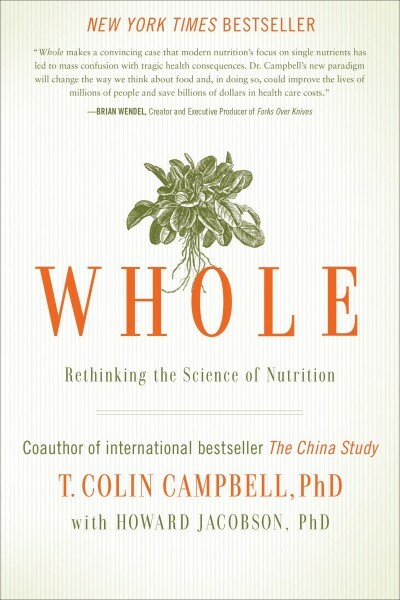 We all know we should eat more fruits and vegetables -- with this book, we now know why. The authors make a well-documented case for why it is important for your personal health and why it is critical for the health of the planet. A compelling book; it is both informative and a pleasure to read! In Healthy Eating, his business mind shines with his exceptional ability to present a wealth of information in clear, precise prose.